I finally put the binding on last night. I have even washed the quilt twice without the binding on. I really hate to do the binding. I am so glad it is done. It is 52 x 65. Small for me. For my birthday we did a cutting bee. 4 of us brought 10 half yard pieces of fabric in light, medium and dark (30 total). We cut it into (3) 2 1\2and (2) 4 1\2 strips. We then traded strips and made quilts out of our strips. I choose basket blocks. 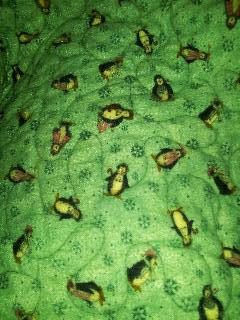 I put flannel on the back (Penguins of course). A small cuddle quilt for me. Better late than never. Love your baskets. 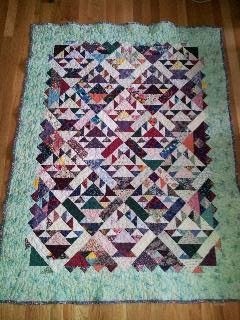 Great work, sometimes it takes time to finish quilts.